Based in the Hertfordshire Business School, Organisations, Markets and Policy Research Group (OMP-RG) is convened by Professor Hulya Dagdeviren. Researchers in Organisations, Markets and Policy are inspired by pluralist/heterodox perspectives in Business Studies (including Economics, Finance and Management), especially critical political economy and institutional economics. Interests in the group focus on the fundamental entities of business studies in the global economy. Some of our work is theoretical, others is applied and has policy oriented focus. We employ and advocate interdisciplinary approaches in both areas. 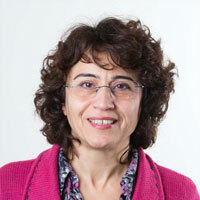 Hulya Dagdeviren is a Professor of Economic Development at University of Hertfordshire. She worked as an advisor for international institutions such as the United Nations Development Programme and acted as external evaluator for the EU research funding programmes. At present, she is the Co-editor in Chief of Competition and Change, an interdisciplinary journal, publishing high quality research on globalisation, financialisation and political economy. Competition and Change is an international peer-reviewed journal, uniquely featuring theoretical, empirical and policy oriented research that aims to develop an understanding of the causes and consequences of competition and change with respect to globalization, financialisation and broader conceptualisations of restructuring capitalist relations. The journal is interdisciplinary and welcomes contributions from a wide range of social science disciplines, including heterodox economics, political economy, critical research on work, management and organisation, economic geography, sociology, development studies and international relations. The Organisations, Markets and Policy Research Group is engaged in networks of international excellence and attracts prestigious grants. Three members of OMP (Professor Geoffrey Hodgson, Dr. Francesca Gagliardi and Dr. David Gindis) hold board-level positions within the World Interdisciplinary Network for Institutional Research (WINIR). WINIR is a global network of around 500 members across 6 continents dedicated to the study of the nature, function, evolution, and impact of the institutions and organisations of economic and social life.